Oh my, how is it already mid July? My solo show at the Park View Gallery in Glen Echo Park opened on July 3rd. The kids and I went to the beach the week after the show and ever since I have been back, I have been pretty much off the computer. Crazy, I know. 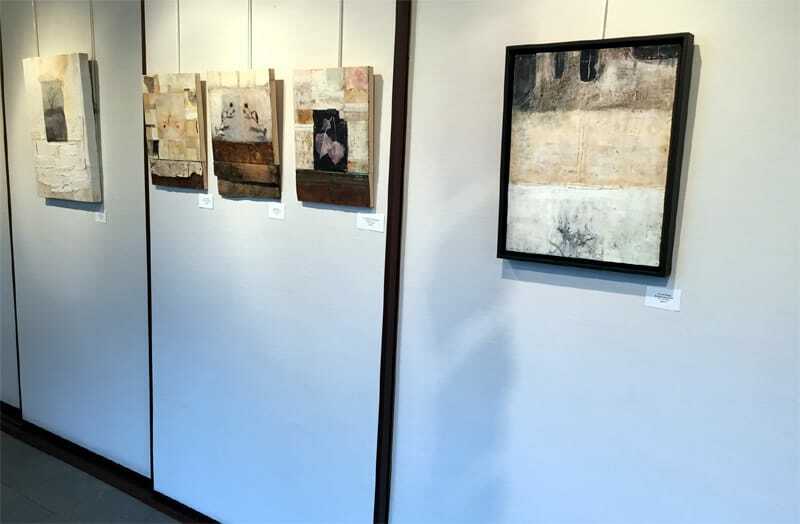 The opening on July 3rd was a really nice evening and there is just always something so gratifying to see a unified body of work all hung up and lit up nicely. What an honor. 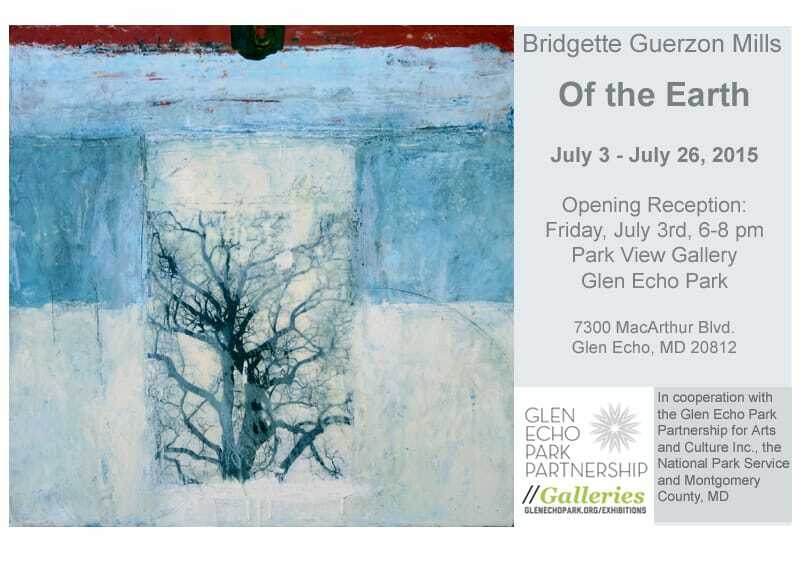 I am so grateful for this opportunity to show this body of work at Glen Echo Park, a place that holds an important spot in the development of my creative self when I was young. One of the things that I am pleased about the show is that I also included some of my book art pieces. I don’t often show my book art pieces. It’s not something I actively pursue. Maybe in the future though. 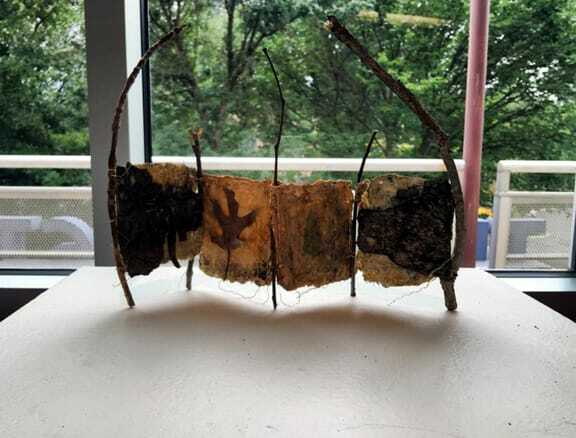 I included my book pieces that are made from earthy materials, found along my hikes and daily wanderings. Books that I wanted to look like ancient vessels buried in the earth, documenting time and the elements. 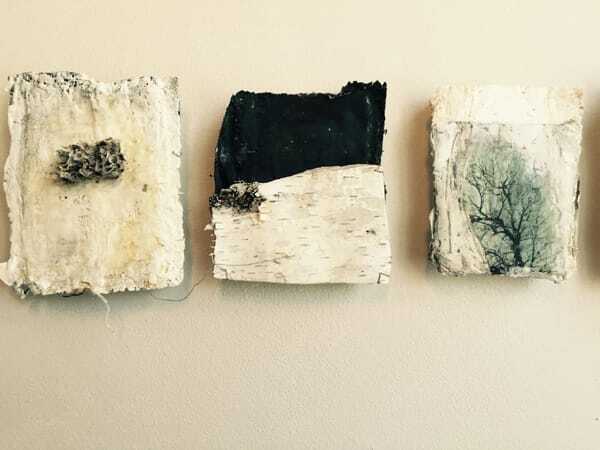 The walls held my mixed media paintings. Here is a portion of the main wall. My first solo I ever had, back 8 years ago I did one wall filled with tiny paintings 4×4 inches and I installed them as a grid. I have always wanted to another wall like that. 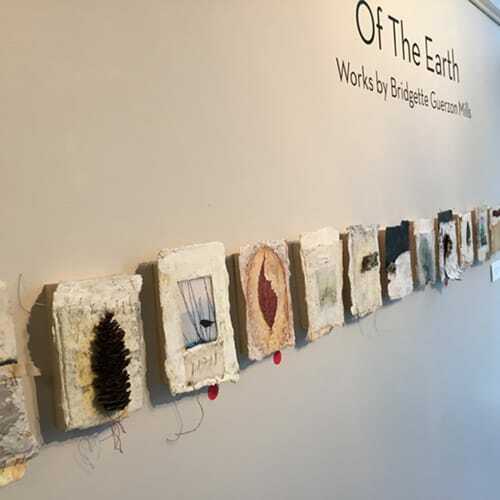 But with these, that I call my Nature Journal Pages, I felt that hanging them across the wall in a line would make an impact when entering the gallery space. I love it! These pages are mounted on wood, making it look like they are floating off the wall. 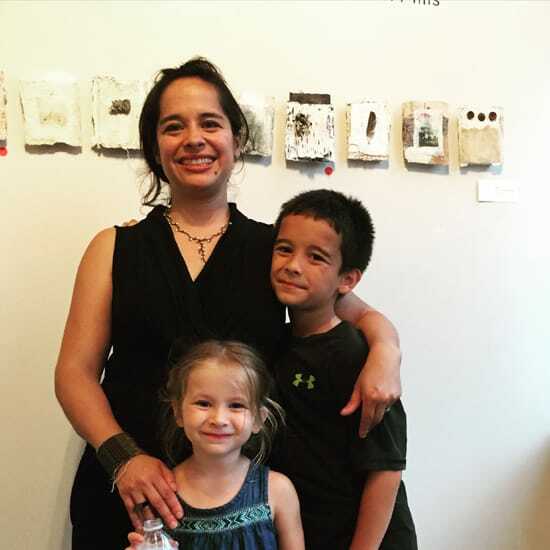 With my best creations and supporters at the opening reception. 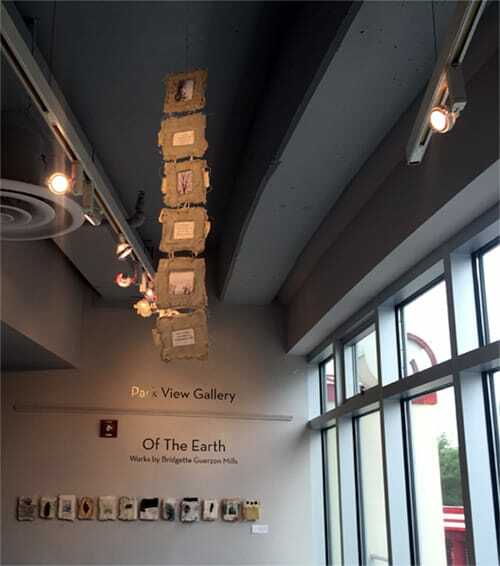 The show is up until July 26, be sure to stop in! *****************************************************************This was my 5th show in 6 months, starting in January! I am grateful and to be honest, a bit tired. But above all, grateful. I have been kicking up my heels a bit and cleaning and organizing like a mad woman. Whenever a show goes up, it’s like a new chapter. The work leaves the studio and my home and enter the world. My studio walls empty out, waiting for what is next. Pondering what I will work on next. One of my main goals in the next month is to organize the business side of things- computer work, etc. Not my favorite thing to do, thus a mess at the moment. I have a lot of updating to do on my website, emails, etc. Slowly, slowly. But first, there are fresh strawberries to bite into and toe dipping in the pool with the kids. Congratulations on your show. I noticed some very interesting pieces, I am oohing and ahhhhing. Wish I lived closer. THe picture of you all is so sweet Such a lovely family. All those smiles! Congratulations! I only wish we still lived in Cabin John or Potomac so I could have attended the opening. I'm sure by now, there would have been several visits to see your work and soak in their soulfulness. Summer is flying by, isn't it? Enjoy! Thank you Jennifer! It is definitely flying by. Hope you and the girls have a good rest of the summer! I live in Queensland, Australia, and came upon your work this morning on Pinterest. Congratulations! the show is beautiful, and I love your work Bridgette.